For years my grandparents would have their nightly cocktail hour, with my grandfather making his customary “manhattan” cocktail. While the cocktails were tasty (not to mention always doubles and extremely strong), eventually I learned that his recipe, containing such ingredients as Seagram’s VO and a splash of Southern Comfort, wasn’t in the vein of your “traditional” Manhattan. Once Erin and I made this discovery, we began a quest for the best Manhattan Recipe. Many recipes online went back and forth with various differing ingredients – Rye Whiskey vs Bourbon, Cherry vs Lemon garnish. We tried many variations, but ultimately focused on a Bourbon base with a Cherry twist. We began experimenting with different Bourbons and Vermouths (always sweet, per the “classic” recipe). We had narrowed our recipe to a basic combination of Maker’s Mark (considered by many recipes to be “the” Bourbon to use) and a Noilly Prat Sweet Vermouth. We were pretty happy with the combination, but not necessarily loving the overall flavor. This all changed one night in San Francisco. During our time in San Francisco, COCO500, a small neighborhood restaurant became one of our most visited haunts. The Fried Green Beans, Polenta, and Panna Cotta were some of my favorite items to order, and Erin and I often spent our meals at the bar chatting with the fantastic bar manager Elaine. One night we finally asked Elaine for a sweet Manhattan, and wouldn’t you know it that drink was the best one we’d ever had. After some prodding, we were finally able to get the names of all the great “secret ingredients,” and we’ve been using them ever since. Recently we’ve tweaked a few things again – trading out the Angostura Bitters for Peychaud’s Aromatic Cocktail Bitters, and moving up the Four Roses ladder to the more flavorful Small Batch variety and we now have a Manhattan that we love to drink when the weekend rolls around. 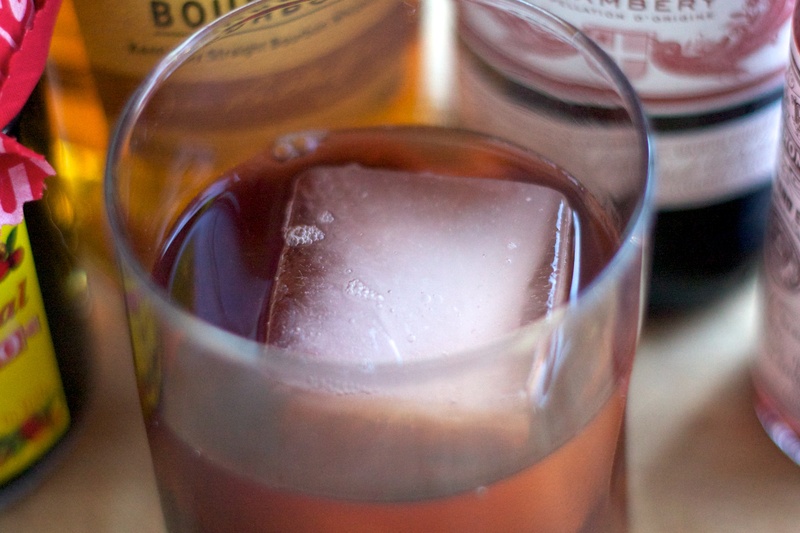 Stir Bourbon, Vermouth, Bitters, and Cherry Syrup with ice, and strain into a Double Old Fashioned glass with Large Ice Cube (made with a Tovolo King Cube Tray). Garnish with Cherries. Oh hellllllllls yes. We’ve got some homemade rhubarb bitters. I’ll bet that’d go nicely as a subtle variation on this. That sounds amazing, Rob! Sign us up!